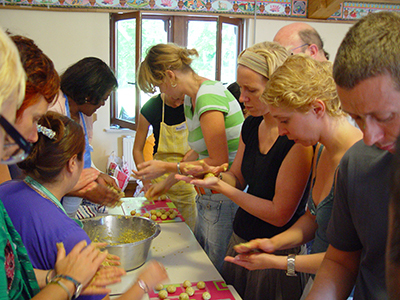 Rolling kofta at a Kurma cooking class, Belgium. 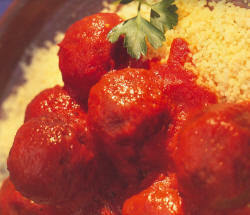 Combine all the kofta ingredients in a bowl until well mixed. Do not add water! The mix should be dry and the balls tight. Do not leave the mixture to sit, but roll the mixture into approximately 24 balls. Heat the oil for deep-frying in a wok or deep pan over fairly high heat to about 180° C / 350° F. Carefully lower in half the balls. Do not stir until they change colour and float. Remove and drain on paper towels. Increase the oil temperature to its original temperature, and repeat the frying procedure for the remaining batch of koftas.